After hurting my knee during the Disney World half marathon on January 10th I was a little worried about the next couple of races I was signed up for. They weren’t too far in the future. I was flying back to LA on Monday and the Star Wars Half Marathon Weekend was happening at Disneyland the following weekend. Yikes! Back in June when I registered for the Star Wars races I decided not to try to run the half marathon since it was only a week after the Disney World half marathon. As much as I really wanted to do it (and complete my Coast to Coast Challenge in record time), I figured it was just too ambitious for me at this point in my running career. And it’s a good thing I set those low expectations since my knee problems would have made a subsequent half marathon excruciating. As a consolation for skipping the half marathon, I registered for both the Star Wars 5K and 10K to still enjoy the weekend, just with less running. After my injury I was definitely concerned that I wouldn’t be healthy enough for the Star Wars races less than a week away, but I actually felt pretty good after resting and icing my knee for a few days. So on Friday morning when I crossed the start line of the Star Wars 5K I thought everything would be fine. It was just 3.1 miles, right? Too bad my knee was hurting so much after the first mile that I had to walk the rest of the race. I was so disappointed. To avoid further injury I ended up walking almost all of the 10K the next morning too. It was probably a mistake to even do that, but there was no way in hell I was going to miss getting the inaugural Star Wars 10K medal! Maybe that makes me materialistic, but I paid quite a bit of money for that race and it was going to take a lot more than a sore knee to keep me from participating. So despite the difficulties, I crossed both the 5K and 10K finish lines, but I felt awful. About a week later I decided I needed to do something about it. This is hard for me to say, but I’m injured. It took me a long time to admit that to myself, but I am no longer in denial and now I’m facing the problem head on. It all started back in Orlando. On my birthday I ran the Disney World 10K and felt absolutely fantastic. It was one of those races that runners dream about. It was effortless. I kept waiting to feel like I was exerting myself at all! I believe that’s what they call a runner’s high. I’ve experienced it so few times myself that I’m unfamiliar with the sensation, though. I never thought it would actually happen to me during a race. In addition to the spectacle of running through Disney World (EPCOT Center, specifically), the runner’s high made the 10K completely magical. I couldn’t have asked for more on my birthday. Fast forward 24 hours. I was standing in my corral before the Disney World half marathon and I knew something was wrong. My knee was hurting and I hadn’t even started running yet. I’d been having some pain on the outside of my left knee intermittently since October, but I hadn’t thought much about it. I always felt better after a little rest and reducing my mileage. No big deal. But something changed on January 10th. Due to the cold weather and lack of shelter prior to the half marathon, my parents and I spent about two hours in a tiny tent at the start line standing shoulder-to-shoulder with as many other people as could cram themselves in there. Everyone was just trying to stay warm! Unfortunately I think that was the tipping point for my knee problems. I knew I was in big trouble when it hurt before the race even started. After feeling amazing during the 10K the day before, I felt pretty awful during the half marathon. There were a few moments where I wasn’t sure if I’d be able to finish the race, but I kept running and still crossed the finish line in a respectable time (for me, at least). I spent the rest of my time in Orlando icing my knee several times a day (many thanks to my mom who thought to bring an ice bag with her!) and taking a lot of ibuprofen. I figured I’d rest for a few days and everything would be fine. Wrong. I took this photo back on August 27th after a big storm system came through the Los Angeles area. Not that we got any rain, though. The storm stayed out at sea so the biggest effect was on the beaches. 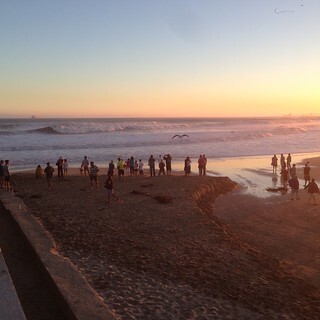 The Seal Beach Pier was closed for a couple of days due to the huge waves, and people flocked to the beach to take pictures. It was pretty amazing! I had an optometrist appointment this morning so I stayed home from work beforehand. On any other day I might have gone to work for a couple of hours prior to the appointment, but then I realized that today was no ordinary day. At 9 AM this morning the annual passholder registration for the Disneyland Half Marathon Weekend opened up! So about ten minutes early I pulled up all of the pertinent webpages (including Facebook so I could monitor the Run Disney and Annual Passholder feeds) on my laptop because I knew the pre-registration spots would sell out quickly. A friend of mine reminded me that this is the tenth anniversary of the Disneyland Half Marathon so all of the races were going to be very popular. And that was definitely true. Based on what I saw on Facebook while waiting for the race registration link to become available (which didn’t happen until about 9:05 AM, much to everyone chagrin), it seems that Disney WORLD annual passholders were able to start signing up quite a few minutes earlier than the DisneyLAND annual passholders so that put us West Coasters at a distinct disadvantage. Luckily I was obsessively refreshing the registration webpage so I got into the system when the link was finally available and I was able to register for the Dumbo Double Dare Challenge (10K + half marathon) without any further problems. Now I know what I’m doing Labor Day weekend! Let’s just hope I’ll be ready. 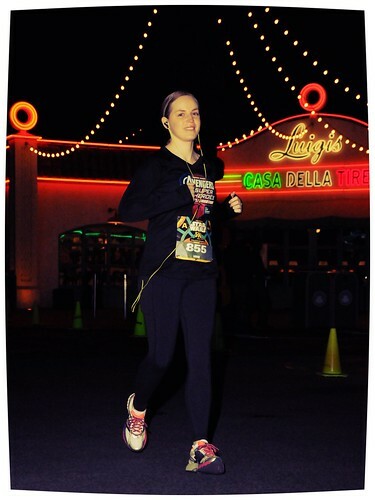 But before I get too discouraged because of my injured knee (more on that in another post), I’m remembering this time last year when I was signing up for the 2014 Disneyland Half Marathon – my very first half marathon. I was so nervous! I’d never run more than about 6 miles and I had no idea if there was any way I could complete a half marathon. It was so intimidating! Little did I know that I was starting something very exciting. Fast forward a year and I’m now fairly confident that I can survive it 13.1 miles (although we’ll see how I do in the Huntington Beach half marathon on Sunday), assuming my body is healthy! Fingers crossed that I’m back to my old self soon. My dad and I will be somewhere between Florida and California when the “X-Files” series finale is aired one week from tonight. Let’s hope that, wherever that is, a Fox network is available. Last week there was major buzz around a possible reboot/revisit of the “X-Files” franchise, and as a massive fan of the series I was extremely excited about this. Then last night I finally listened to the Nerdist podcast that was actually the impetus of the movement. It was amazing! As I mentioned in my previous post about my second New Year’s resolution, I’ve been listening to Nerdist podcasts in the evening while I’m getting ready for bed. I enjoy just about every episode, but this particular one was really special. Not only was Gillian Anderson an incredibly awesome guest (I didn’t know what to expect, but she was fantastic), but she and the hosts actually invented the #XFiles2015 hashtag that started it all! How cool would it be if that podcast turns out to be the catalyst for new X-Files content on television? I’m super excited just thinking about it. Not only was I watching the show when it was still on Fox every Sunday night (I remember watching the season finale in a hotel room in Utah back in 2002), but I enjoyed the “I Want to Believe” movie back in 2008 too (I just added it to my Netflix queue so I can watch it again). Pretty much anything in the X-Files universe is fine by me. And besides just crossing all of my fingers and toes to help this effort, I wrote a tweet with the #XFiles2015 hashtag tonight. New X-Files must happen! And if there’s anything else I can do to keep the ball rolling I hope someone will let me know! I know I’ve said this many times before, but I watch too much television. Besides the fact that I have amassed way too many shows that I DVR every week, I really just like having the TV on in general when I’m at home. I like the noise and the entertainment, but I am fully aware that I should cut back. So this year I decided to finally start making some progress on that front. The first thing I did was give my eyes a break at bedtime. I used to watch TV on my iPad while getting ready for bed every night and then leave the Time Warner app running as I fell asleep. Usually I just found some channel or another that was showing old sitcom reruns which acted like a white noise machine as I drifted off to dreamland. But beginning on New Year’s Day I stopped that completely. Now I listen to either podcasts (Nerdist or Fresh Air) or the radio (via the iHeartRadio app) when I’m getting ready for bed, and then turn it off when I’m ready to go to sleep. And it’s been quite nice, actually. Considerable reduction of eye strain and elimination of potentially sleep ruining blue light from my electronics! However, I do read on my iPad Mini after I get into bed, but since mid-December I’ve had a blue light filter on it. I don’t want to discourage nightly reading (especially since one of my resolutions last year was to read every night before bed), but I also want to improve the quality of my sleep. And I think the blue light filters on my iPads have been working so far. I actually bought one for my laptop as well, but it was defective so I had to ask the company to send me a replacement. There were a few small creases on the screen that made application without air bubble completely impossible (and incredibly frustrating). But that’s beside the point right now. What I wanted to report today is that I’ve started making strides to cut back on my TV viewing. Hopefully I’ll have a lot more progress to share throughout the year. I’ll keep you posted! Historically January is the month that I blog the most, but this year has been an exception. January can seem relatively quiet and dull after the excitement of the holidays is over. During this winter month I normally fill my extra free time with writing (specifically documenting how I spent my Christmas vacation). Not so much this month, but it’s been an unusually busy start to the year so far! Where do I even start? I’m planning to write more on all of this soon, but here’s a little recap for now. After New Year’s I was back to work for a grand total of three days before I was on vacation again. My five days in Orlando were pretty great! On my birthday I ran the Walt Disney World 10K and felt fantastic. Then my parents and I spent the afternoon at Disney’s Animal Kingdom (and froze our butts off!). 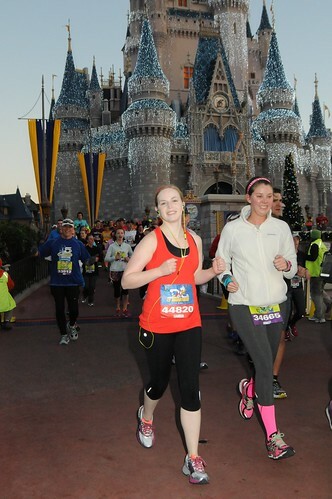 The next morning I ran the Disney World Half Marathon and crossed the finish line injured. That was really discouraging. On Sunday we went to Universal Studios to visit the Wizarding World of Harry Potter which was amazing. I flew home on Monday and went back to work on Tuesday. Then on Thursday I went to the Disneyland Hotel for the Star Wars Half Marathon Weekend expo. On Friday morning I started running the Star Wars 5K, but quickly discovered that my knee was still injured. Very disappointing. 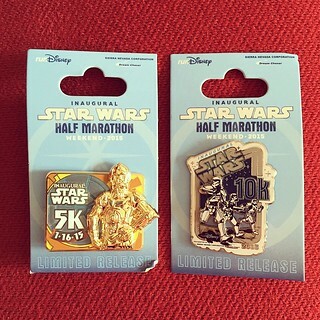 I still participated in the Star Wars 10K the next morning, but I walked the majority of the course. At least I got my medal! Now it’s Sunday and I’m back at home preparing for a very busy week at work. I spent the afternoon roasting vegetables and putting together lunches for the week. It’s funny, but I think this is going to be my first normal week since the holidays. I still have a lot of things I need to do before I’m caught up with all of my usual chores, but I’m already starting to feel less stressed. Phew! I’m looking forward to having a little down time to get organized, gather my thoughts, and write about the crazy 2015 I’ve had so far. And the best thing is that I know there’s so much more awesome stuff to come this year! 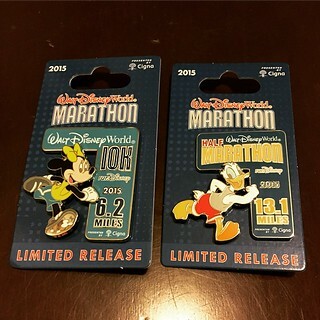 Walt Disney World races complete!